The short answer is no. Reviews aren't 5 stars or 1 star with nothing in between. That's not to say they're spread equally among stars either. 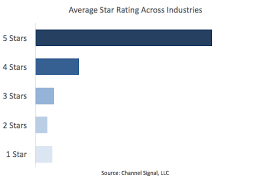 A look at nearly 2.5 million product reviews collected by Channel Signal across industries and sources shows the breakout favors 5 stars. 5 Stars is heavily favored at 65.8% of all reviews. And the 1 Star rating category is minimal at 6.3% of all reviews. But that middle section of 2 to 4 Stars makes up 27.8% of all ratings, which is more than the 1 Star rating level. So there's the answer to clear the air. Reviews are not polarized with lots of 5's and 1's and nothing in between. The star average for a product is an important part of the decision-making process for shoppers, but it isn't the only one. In the middle and upper rating levels, we see that shoppers take the next step to read and discern other users' experiences with the product. They're looking for use cases and story lines that match their own. They will make the call whether the user's complaint would preclude their own happiness with a product. For example, if a shopper is looking for a baby gate for her walking toddler, and a reviewer is complaining that her puppy jumps over the gate, that's a different use case. The shopper can look past it. Even while sales are happening at the middle and upper rating levels, there is still a bevy of intelligent actions that can be taken by a brand to understand these nuances and improve performance. While 1 Star reviews do have criticisms that should be measured, there is some really juicy stuff in the 2 to 5 star reviews. One of the easiest ways to tell when a reviewer has actionable feedback for a brand is by the use of pivot language. Pivot language is when a reviewer leaves their generally neutral to positive thoughts about a product, and then they "pivot" to the brand using phrases such as "but I wish that" or "the one thing that would make this better". They then provide a critical piece of advice that would have resulted in the product being the perfect match for them. This type of language and the subsequent feedback is something Channel Signal monitors closely for many companies. Aggregate and analyze your reviews from any site—starting with the star rating and drilling down into actionable feedback—with Channel Signal.